Gli smalti color verde menta sono tra quelli che indosso più volentieri, mi piace decorarli in modi semplici così che risalti al massimo il colore di base. Per la nail art di oggi, che prosegue la mia maratona di trentuno nail art del 31 Day Challenge 2015, mi sono affidata allo smalto Kiko Power Pro #33 Lattementa (trovi lo swatch e la review qui) e a degli adesivi presi da Born Pretty Store. Mi è bastato aspettare che lo smalto asciugasse e applicare i pezzetti già tagliati di adesivo, ho applicato il top coat per proteggere la nail art. In questa foto trovi anche la versione accent nail, ma questa volta io preferisco decisamente la full nail art! E tu? I really love mint polishes and I like to decorate them in a simple way so the base is still visible. Today nail art is for 31 Day Challenge 2015 and I used Kiko Power Pro #33 Lattementa (you can find my swatch and review at this link) and some stickers I bought from Born Pretty Store. 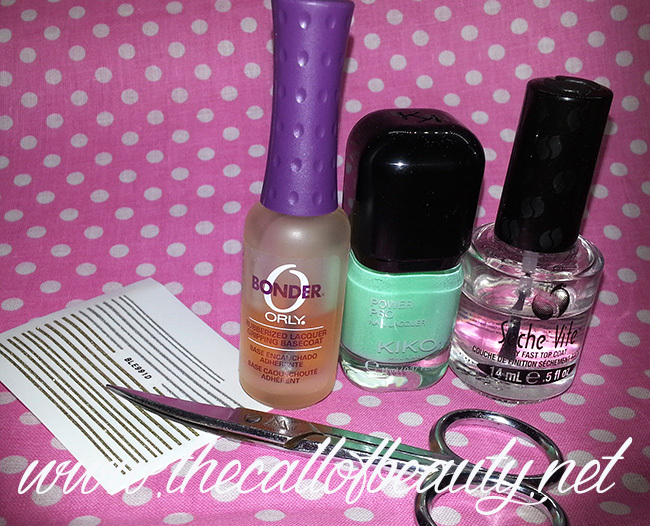 I applyed the mint polish and when it dried I placed the stickers cutted in piece. I applyed the top coat for preventing chipping. In a pic you find the accent version of this nail art, this time I prefer the full mani version, and you? wow such a creative idea, I'm a big fan of this manicure! Very ingenious looking french mani! Love the mint green with the little bit of glitter! I love mint and silver glitter too!! !